I'm feeling a little nostalgic lately, so I decided to share a recipe we always made growing up. This soup recipe was past down from my aunt. Brown the Italian Sausage in a large heavy bottom stock pot. I prefer to use either sweet Italian sausage or spicy Italian sausage. The mild sausage doesn't quite fill out the flavor profile of the soup. Remove the browned Italian sausage from the pot. There should be about a tablespoon of grease left behind from the sausage. If not, add a little bit of olive oil. Sauté the onions and garlic. Add the Italian sausage back in to the pot. Add the remaining ingredients bring to a boil. Let simmer for about 25-30 minutes. 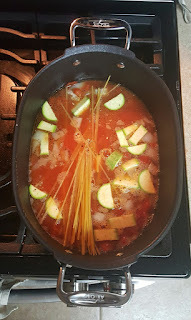 Add the noodles, zucchini, and parsley and simmer another 10-15 minutes. Penne or Rigatoni pasta work the best, but I usually use whatever is lying around the pantry. Sometimes I'll add a can of Great Northern White beans as a substitute for the noodles. 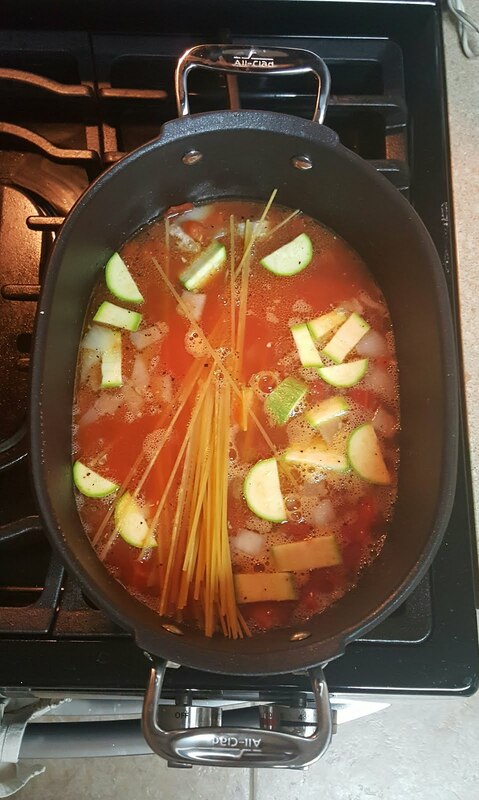 Other times, I'll use both the beans and noodles to make the soup a little bit more hearty. Sometimes I'll stir in a little spinach at the end too.